Arminda Martin, second from left, and her husband Theodore Martin, right, await their sentence Friday afternoon in Delaware County Common Pleas Court. 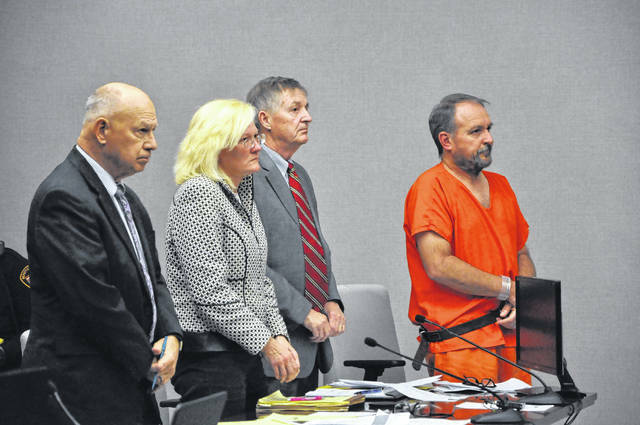 Attorney Kingston Malley Jr., left, represented Arminda Martin and attorney William Leber, second from right, represented Theodore Martin during the case. The owners of Fairview Memorial Park were sentenced to four and a half years and five years in prison, respectively, Friday and ordered to pay restitution to 67 victims in the amount of more than $183,000. Theodore L. Martin, 54, and Arminda K. Martin, 46, appeared in Delaware County Common Pleas Court to be sentenced for 14 theft charges and 15 theft charges, respectively. Delaware County Common Pleas Court Judge Everett Krueger sentenced Arminda Martin to four and half years in prison and sentenced Theodore Martin to five years in prison and ordered them to pay $183,261.40 in restitution. Krueger credited Arminda Martin 84 days she spent in jail during the case and credited Theodore Martin 78 days. At their change of plea hearings, the Martins admitted to taking money from Delaware County residents for products or services at Fairview Memorial Park, but never delivering the items and instead spending the money at a casino in Pennsylvania. As part of the plea agreement, 63 theft charges against Theodore Martin were dismissed and 43 charges against Arminda Martin were dismissed. A condition of the plea agreement was that the Martins pay restitution for all 67 victims, not just the ones in the charges to which they pleaded guilty. Numerous victims or family members of victims were present at the hearing and several delivered brief statements to Delaware County Common Pleas Court Judge Everett Krueger about the impact that the Martins’ actions had on them. “I hope he gets on his knees to ask God to forgive him for what he’s done,” one victim told Krueger. All of the victims or family members who spoke asked for prison terms for the Martins and said the damage done to their families has been psychological and emotional, not just financial. Arminda Martin’s attorney, Kingston Malley Jr., said that the Martins gambled money at the casino in an attempt get out of the debt they owned from their cemetery in Pennsylvania. Theodore Martin addressed Krueger during the hearing and said he and his wife bought a cemetery in Pennsylvania believing everything was above board, but soon learned that the previous owner had taken money for goods and services and never delivered. Theodore Martin then said he and Arminda Martin bought Fairview Memorial Park and Grandview Memorial Park in Ravenna, Ohio as a way to make money to pay off the Pennsylvania cemetery’s debt, but found themselves in the same situation with those two cemeteries. Theodore Martin said he and Arminda gambled at the casino with the money they got from selling items in an attempt to pay back their debts. He said he and Arminda haven’t been paid for their work selling items at the cemetery because they used it to pay outstanding debts at the cemetery. Arminda Martin tearfully said she was sorry and hoped one day the victims could forgive her for what she had done. Before handing down the sentence, Krueger said the theft charges carried a presumption of community control, but said he believed that the circumstances of the case were such that prison terms would be appropriate. AC Strip Esq., a Columbus based attorney, was appointed as the receiver for Fairview in May and has been delivering regular reports to Delaware County Common Pleas Judge David Gormley about the status of the cemetery. Gormley ordered that Fairview Memorial Park Inc., the corporation owned by the Martins, be dissolved and ordered that the cemetery be sold. On Tuesday, Strip reported that he had placed an ad for the cemetery in the newspaper of the Ohio Cemetery Association and said the ad has generated some interested. He added that he has also been in contact with third parties who may be interested in purchasing the cemetery.